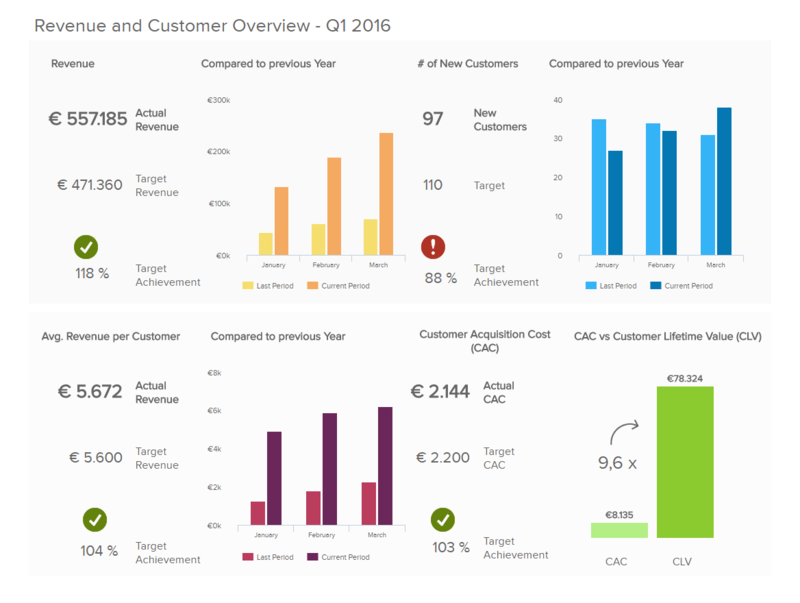 Data dashboards are one of the best innovations in business intelligence of all time. But what are data dashboards? What is a common definition? Exclusive Bonus Content: Ready to make analytics easy? Get started with our free guide to the benefits of data dashboards! Behind the scenes, dashboards integrate all of the information you need from all of the different data sources your company has. However, what you (the end user) see are simple tables, charts, and graphs – all in real time. Now that you have at least a basic understanding of what they are and how they can benefit your company, let’s dig deeper into some of their uses. One of the biggest advantages data dashboards have over more traditional spreadsheets is that they are almost infinitely customizable and flexible. This makes sense operationally, as the same data is used in very different ways by different people in your company. Let’s say our sales executive wanted to dig deeper into the data around a promising new hire. If she was using a dashboard software, she could simply tap a few buttons on her dashboard and get to a view similar to that of the sales manager. Conversely, if the sales manager (or even the rep) wanted to understand how their job role fit into the company as a whole, they could “zoom out” as needed. This kind of “focus adjustment” just isn’t possible with spreadsheets. When presenting data and communicating insights, it is important to create a dialogue – no one likes being preached throughout a whole presentation. Letting your audience being part of it thanks to interactive dashboard features will convey your message more efficiently. By using real-time data and manipulating it live, encouraging your listeners to ask questions and drill-down the information by themselves, explore on their own, they will be much more engaged in the discussion. 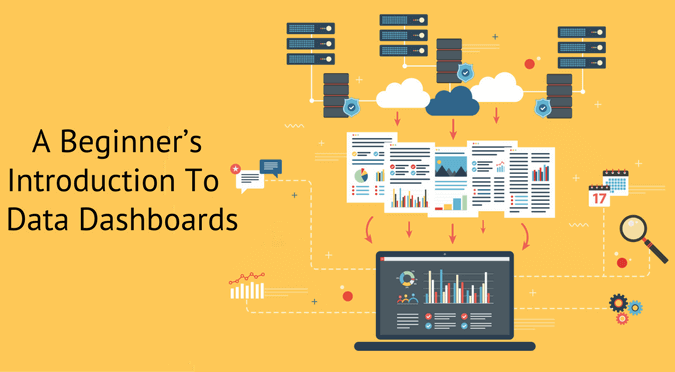 The interactivity is especially interesting in dashboarding with a diverse audience: newcomers are onboarded easily while experts can dig deeper in the data for more insights. The business world changes quickly. If you’re still running analytics reports by sending them to your IT department and then waiting to get them back, your company is missing out on situations where agility wins. If you have to wait days or weeks to get data on a situation, it might be too late to make necessary changes. For example, with real-time monitoring, you can see how a phone outreach campaign is going for a big product launch you have coming up. If, a week into the campaign, you notice that you’re not getting any results via your dashboard, you can make a quick intervention and switch to digital ads, direct mail, or some other strategy. You’re saving yourself a big opportunity cost here. When you use dashboards, you have one centralized location where all of your users can access your data. This is in contrast to a myriad of spreadsheets, software, and databases that represent the legacy approach. As in: all of your PPC data is in Facebook, while all of your customer data is in your CRM software, and your income/loss statements are in your mainframe (which is running on 1980s software and requires an IT staff member to operate). Not pretty. Instead, with 24/7/365 dashboard solutions like datapine, if someone wants to make a data-driven decision or presentation at the next staff meeting, all they have to do is pull out their tablet. Let’s be honest – most human beings find it easier to understand a graph than a long, tedious Excel spreadsheet full of numbers. Dashboards allow you to “tease out” patterns in your data that you might not see in a purely numerical format. Additionally, people have different levels of “tech savvy.” Some users may find even an Excel document to be quite difficult to work with. Dashboards make everything accessible. In order to have a dashboard culture, everyone on your team needs to be on board. That can’t happen if some employees don’t have the same access to data that other employees do, whether due to technical comfort levels or simply due to data being spread out. When everyone on your team is looking at the same set of numbers, they can understand the team’s mission in a much more tangible way. You can point to sales numbers and really connect them with future goals and projections. This kind of connection is priceless. Perhaps the biggest reason to use dashboards for understanding your data is that they force you to focus. One of the keypoint to remember when creating a stunning dashboard, is that you shouldn’t overwhelm it with too many KPIs. From a visual and aesthetic perspective, things get cluttered if you put too much on the screen. From an effectiveness standpoint, your mind starts to wonder what’s important. Therefore, if you’re using dashboards the right way, your brain always knows what KPIs are important – the ones on the screen. You can even make more important KPIs bigger, further reinforcing their status in your mind. As Tony Robbins says, “Where focus goes, energy flows.” In other words, you take action on what you focus on. Dashboards make it easy to focus on what’s truly important. 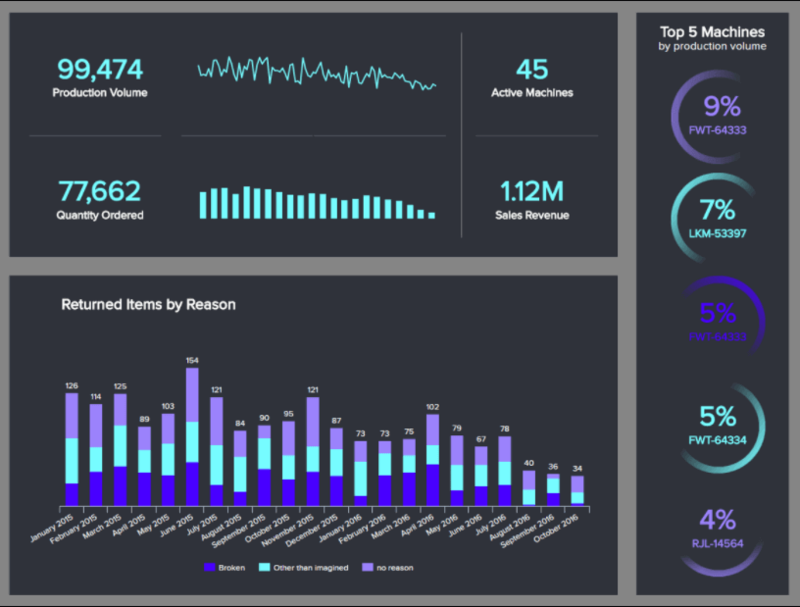 Now that you know what dashboards are and how they can help you, let’s take a look at personal top 5. You can check out 30+ business dashboard examples for different business functions (marketing, sales, finance, management etc.) and industries (healthcare, retail, logistics, manufacturing etc.) on our website. This dashboard does a great job of keeping things focused and avoids clutter through the liberal use of white space. 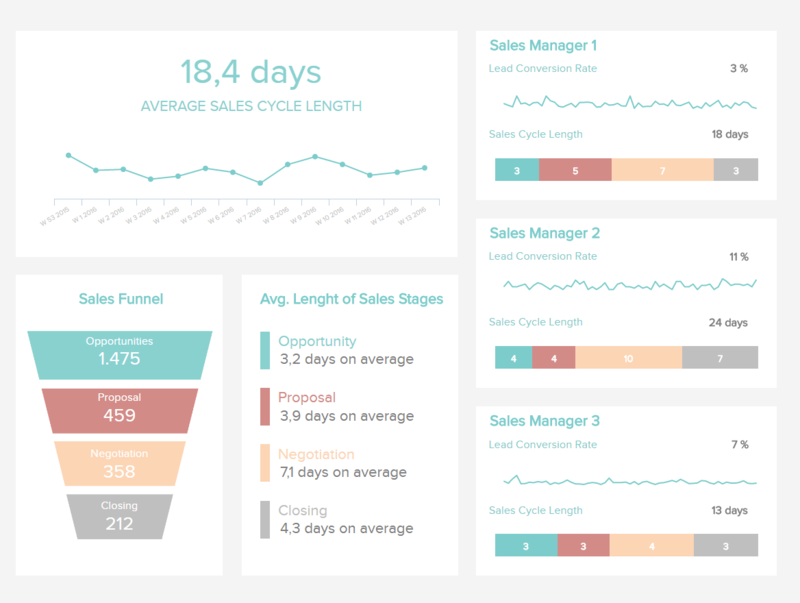 This sales cycle length dashboard is a sales manager’s dream. This dashboard example breaks down how long customers are taking to move through your funnel, on average. It expands on this by showing how different sales managers are performing compared to one another. Finally, it makes things even more nitty-gritty by breaking down these sales KPIs into how many people are at each stage of the funnel and how long each stage lasts on average. If you use digital marketing heavily in your business, this web analytics dashboard will soon become your best friend. How many pages are they looking at? How many people are converting? 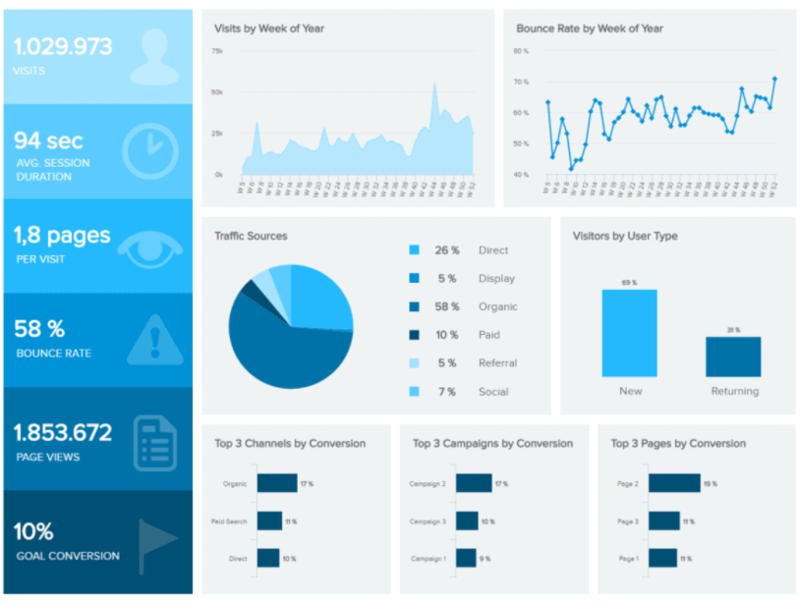 This dashboard goes even further by breaking down your top converting channels, campaigns, and pages, and showing how much of your traffic is coming from each channel. This kind of information makes it really easy to know where you should prioritize your time and energy. If your company is in the manufacturing business, that production dashboard will prove invaluable. With manufacturing KPIs for your total production volume, your sales revenue, your units ordered, and your top performing machines, you have your finger on the pulse of your factory. Finally, the refunded items by reason graph serves as an “early warning sign” for manufacturing defects. Our final dashboard example shows how big data and data analytics can impact the logistics industry. When it comes to logistics, every moment matters, and you want as many deliveries as possible to be on time. 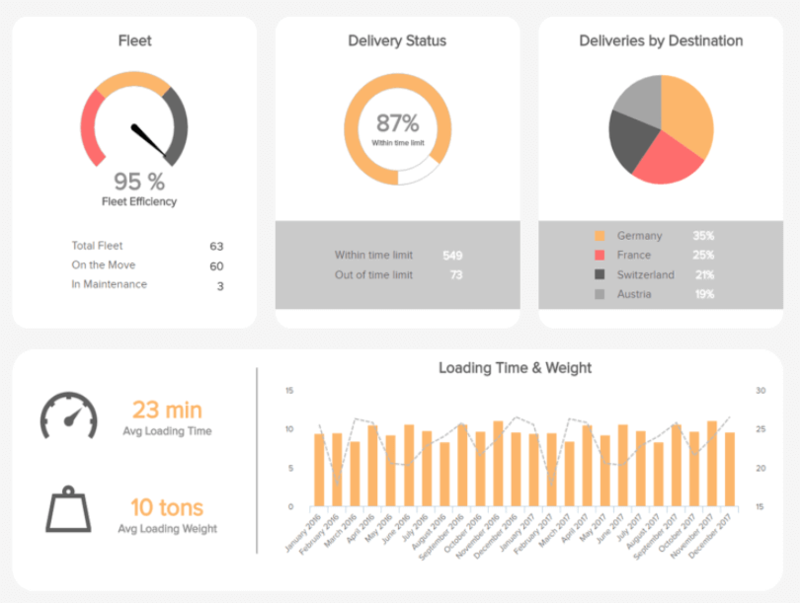 This transportation dashboard makes it easy with delivery status, fleet efficiency, average loading time and other logistics KPIs. You don’t have to look far to get started with data dashboards. datapine’s dashboards are intuitive, interactive, and customizable. They display all of your data in real-time. Finally, they gather all of your data in one easy to access place. Click here to start a 14-day free trial of our dashboard software!